“We are the guides we seek. We are the love we yearn for. At the end of October, I headed out on another profound journey to a new land to meet new and old friends. What I did not expect was how incredible this trip would be in more ways than I can express. Not only is it an honor and privilege to have this ability to travel the world, leading people deep into their bodies, hearts, and souls while experiencing a new outer landscape, but it is also amazing to me how much I learn and understand each time from the sharing and friendships that form while we are all experiencing our new inner landscape as well. When we pull away from our day to day routines, the hectic pace that most of us live by, and let ourselves pause…things change inside. The shift is real! The clarity is so potent, one has the ability to make new relationships with self and with others. We have less fear to move through the world and show a much greater capacity for trusting and loving all. Maybe just maybe we can hold onto this new sense and continue to spread this love like sunbeams out to everyone in the entire world! Lake Atitlán is believed by the Maya to be the center of the universe; the place where God’s seeds of mankind evolved. They also believed that this majestic lake represents the belly button or manipura chakra of the Earth. In human beings the manipura chakra is located at the solar plexus. In both cases, the location on the earth and the place in the body are characterized by the element of fire, which governs all processes of transformation. Cradled in the embrace of 3 majestic volcanoes, Lake Atitlán holds the potential for profound metamorphosis of mind, body and spirit. Here, we were supported in finding a deeper connection to the heart of the Earth, and therefore, our own heart, which allows the song of your soul to be clearly heard and wholeheartedly celebrated. 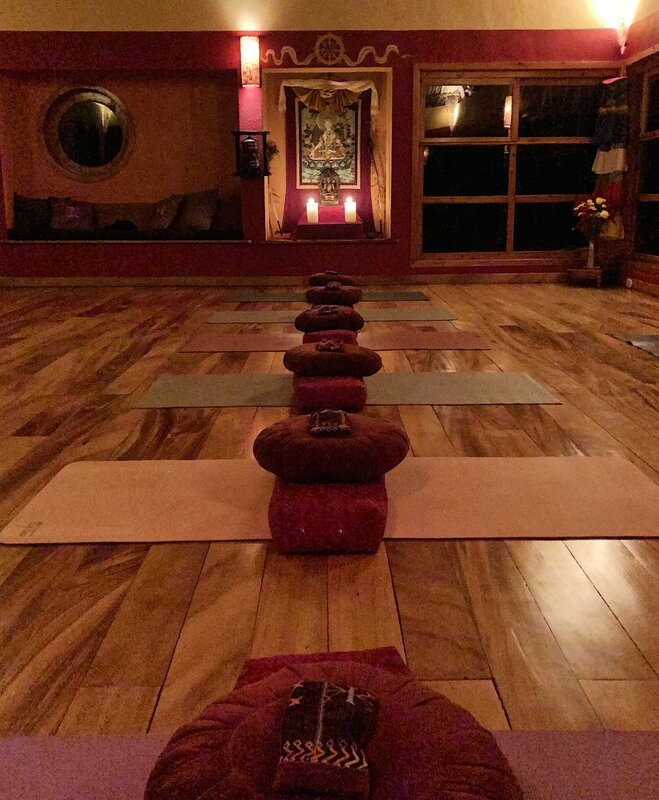 Our first yoga practice began Sunday morning in our stunning yoga temple on the top floor of our house. With the energy of the land, I thought it was a perfect time for us to journey through the chakras. I had planned our practices many, many months in advance, with this intuitive sense that this was the right place to dig into this work! Being located in a temple high above the ground and which also represented the upper chakras, we began with grounding into our root! The root chakra also known as Muladhara (mul = base, adhara = support) is the chakra of the earth. It is the source of our earthly connection and survival, vitality and strength, our sense of belonging and trust. Metaphorically speaking, this is our most Primal Self; the instinctual animal parts of our being. Our fight, flight, freeze fear responses, and our sense of being grounded and secure. Perhaps you can see why beginning with our root was relevant here. Not only to help us establish a connection to the earth and land we were residing on, but also to help release and remove the fear that had many questioning if this trip was safe. 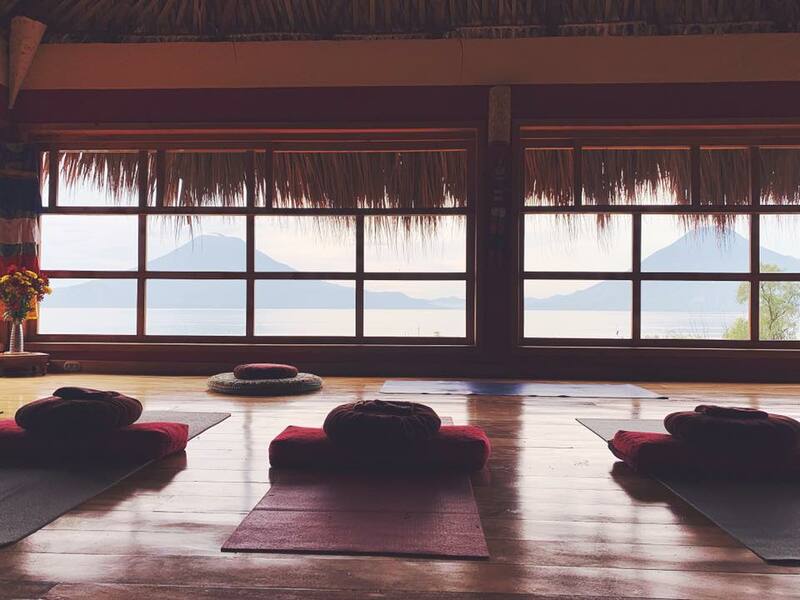 We practiced a mountain meditation, grounded with asana, re-centered and established our connections to self, each other, and the beautiful Guatemalan culture. All fear dissipated as we landed in our root and felt deeply content in our new home and in our hearts. We continued our chakra journey day by day, connecting the second chakra with the water element and the lake energy. Our third chakra and the power of the sun and fire. Only to find ourselves midweek ready for the heart. Coincidentally, this was also our cacao ceremony day, which is also heart-centered. The heart chakra connects the lower and upper chakras together and is considered the first energy center that focuses inward and moves beyond the body, toward the center of compassion and love. Anahata, means unhurt, and is associated with healing, nurturing, and opening. Once the body feels safe, grounded and centered, it is able to open. Our ceremony was led by 2 woman, Red Hawk and White Condor, who skillfully guided us through several rounds of sharing, cleansing, and clearing of our heart spaces. Needless to say, during the first round the tears were flowing, and we were ready for some of that cacao heart energy to be moving through our bodies. Cacao was cultivated by Mayas more than 2,500 years ago and it was called “Ku-Ku”. Ku in Mayan Language means Sacred and Ku-Ku “above sacred”. Aztecs learned from Mayas how to cultivate and prepare it, they called Cacao “Cacahuatl” and the bitter drink that they obtained from his fruits “Xocolatl”. This drink was consumed just by Emperor and Nobility and is called Kakaw in Mayan Language that means “Drink of the Gods”. According to Mayan Elders and Archaeologists, Spirit of Cacao is one of the most powerful Deities of Mayan Cosmology. With the Spirit of Cacao we can travel towards our Innerself where our Wisdom and Love live. 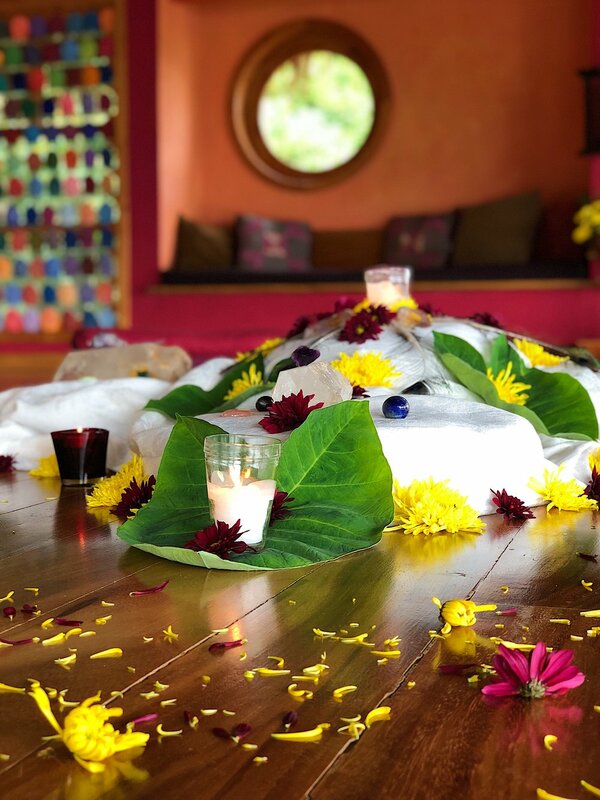 This ceremony is oriented to reconnect with Beauty, Sweetness and Love in ourselves. 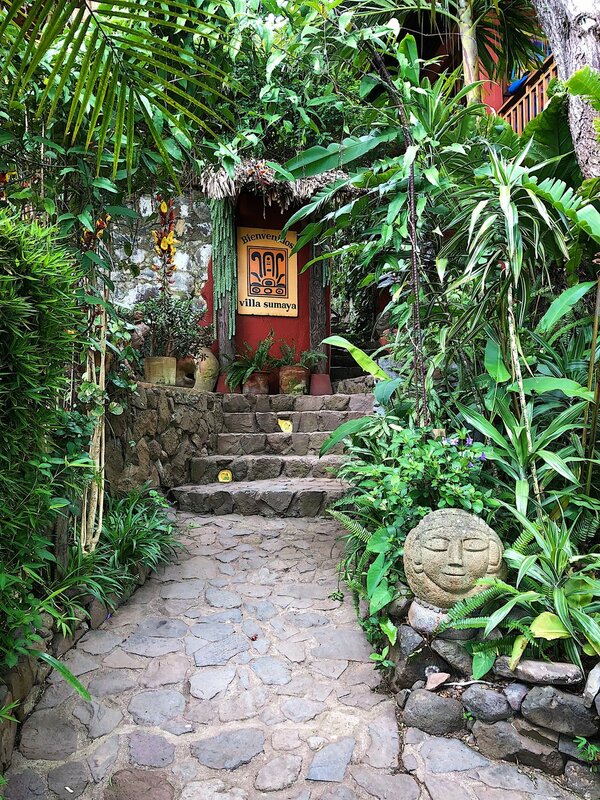 Cacao Goddess is our magic companion that will invite us to open the Heart Door: it is up to us and our level of consciousness if we will be able to cross the Door. 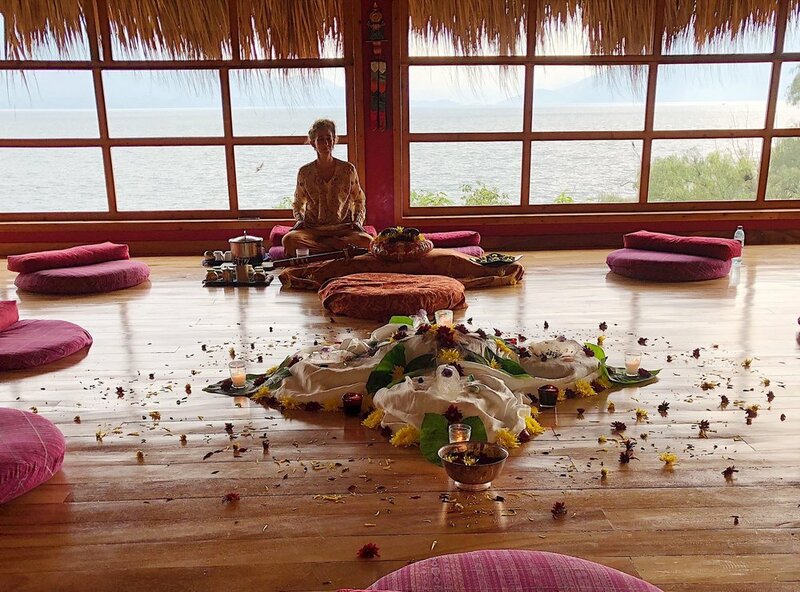 The cacao ceremony left us with full bellies and warm open hearts! On Thursday, we had planned to travel to the ChiChi market, the biggest market in the area held only on Thursdays and Sundays. Everyone was excited to shop for some colorful gifts and tapestries. However, after the long and winding bus trip through the mountains, all were a bit deflated and nauseous on arrival. The market was certainly colorful and bustling from end to end. Also just a bit of shock to arrive to the frenetic energy and the constant soliciting when coming from such a peaceful environment prior. 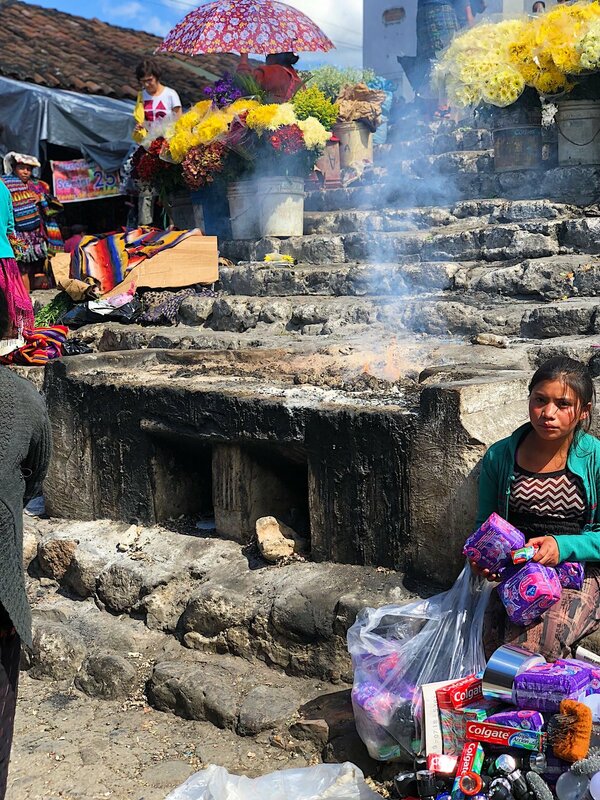 Fair warning here…if traveling to Guatemala know this is not a necessary thing to see unless you enjoy haggling and being packed like sardines in the street with people and dogs. With all that we made the best of our time and many of us bought some great gift items for our families back home. Exhausted upon our return back to Villa Sumaya, we took the evening to enjoy a nice dinner together and rest. The food at Villa Sumaya was wonderful as well as the staff! Our meals had variety for the vegetarian, vegan, gluten and dairy free. They were creative, nourishing and always delicious! Friday was our last day and most of us chose to soak in the land and peaceful nature of where we were. I took a walk on an ancient path on the sacred land, along the lake through the jungle of leaves and vines, roots and rocks. Hoping to carry the essence of this great land, our time and practices together. Carrying this home and into our daily lives. Remembering our way back to self is often a tough road when we feel buried under so many stories or ideals of what we think we are and the stressors of life in general. At times we may have to go far beyond familiar ground to find that place we call home. And sometimes traveling outside of your comfort zone is just enough to shake you out of your slumber to begin the transformation. Take whatever awareness or realization you acquire in each moment and use it to guide you out of any uncertainty in life. Aim to move from a place of compassion in your thoughts, words, and actions. Set up your conditions to receive grace. This is like practicing the correct form in a yoga pose. The flow you feel is the flow of grace, raining upon you when have set up the right conditions. If we are gentle with ourselves in our daily lives and in our interactions with each other. If we are balancing grace and effort, we may also live life like that! Connect to the purpose of your heart, sit still, learn to listen…pure listening. Draw your maps from there and then bound forward. Traveling gives one a passport to the soul, it peels the hardened edges away from the heart, it softens ones entire being to an incredible awakening and truly shows us how interconnected we all are! Until our next journey together! Every step is a conscious step…stay awake my friends! Sign up for where and when I’ll be in your area or on retreat! In the Mahayana vehicle the Buddha teaches us that we should be more concerned for the welfare of sentient beings than we should for our own. If we examine ourselves carefully, however, we understand that that is not a natural way for us to behave. The survival of self has always been our primary concern, and the habit or strong habitual tendency of preserving the ego is so deeply ingrained we do not actually understand how frequently we engage in it. Now you might disagree, thinking, "Well, I was very kind to my family yesterday, and I was kind and generous to my friends last week. I even gave some things away." If you think like that, think again. The only way that you can remember when you were kind is by comparison to other times. This means that there has to be a hefty measure of time when you were not kind, to be able to compare the two. If we were truly bodhisattvas here solely to benefit sentient beings, the activity of kindness would be so all-pervasive and natural we wouldn't be able to discriminate it. One would not know that one was kind. If someone were to say to you, "You're really kind. Your whole life is kindness," one would say, "Really?" because one wouldn't know. There would be nothing to compare it to. When we look at our kindness truthfully, we often find out it is all about us, and for the most part has very little to do with anyone else. This is a hard truth to face, but it must be faced in order to discover what the Buddha is talking about when he speaks of kindness toward all sentient beings. Self-examination often leads us to the decision to be a kind person. When your decision is about being a kind person, however, there is actually very little true caring for the welfare of sentient beings. What you are really trying to do is to find yourself, or to like yourself, or to label yourself, to discriminate between self and other and to continue the continuum of egocentricity. When a person decides to be kind, they do so because they want to be a certain way or they want to present themselves a certain way, but generally it's all about them. The Buddha teaches us when we wish to embody the virtue of compassion -- when we actually decide to be kind -- we should do so for very logical reasons. First, we should study cyclic existence, the cycle of death and rebirth well enough to see its faults. One of the main faults of cyclic existence is that everyone who is born will die. Coupled with this is that during the entire time you're alive until you start to age or become extremely sick you forget that simple fact, and you do not act appropriately. We're all going to experience the experience of death. But the way you're thinking now and the way you act the rest of the day will demonstrate that you're not thinking like that. You will act like a person who does not remember his or her own death. Because the other thing that you learn about your death is that when you die you can't take anything with you, not a thing -- except the condition, or karma, or habitual tendency of your mind. The other thing we'll do is try to accumulate material goods for no good purpose other than that we want them. We forget we can't take them with us. We don't act like people who know that. We act like people who believe in some kind of hokey fairly tale or story that can't possibly come true. In cyclic existence we also suffer from the suffering of suffering. If we had a different kind of mind, we could see birth and death and our minds would be stable and spacious. Perhaps these events wouldn't bother us so much. Unfortunately everything bothers us. Everything is something we react toward, because it is the nature of our mind to react toward everything with acceptance or rejection, hope and fear. What must come from that is hatred, greed and ignorance. We either hate something, or we want it, or we ignore it. Thus, we engage in the suffering of suffering. We not only experience death, we suffer because of our reaction to death. We not only experience separation, we suffer because of our reaction to separation. So these are the faults of cyclic existence, and what else would you do other than practice a path that leads to the cessation of suffering? You could accumulate material goods, but what good will that do? Or you could continue the habit of being hateful. What good would that do? Or you could continue to grasp. What good would that do? The Buddha teaches us that there is an end to suffering. That end is to exit cyclic existence; and in order to leave, one must achieve liberation, or enlightenment. Upon awakening to the enlightened state, one no longer revolves in cyclic existence, because one does not have the building blocks of death and rebirth which are based on the assumption of ego, or self nature as being inherently real, and the reaction to phenomenal experiences. That is what cyclic existence actually is--that through that means one actually creates the karma of suffering and death, the endless experience or cycle we find ourselves in. The Buddha teaches us that to attain enlightenment, to awaken to the primordial wisdom state, one no longer accumulates karma. In fact all of that perceptual experience is pacified, in that one finally awakens to and truly views the primordial wisdom nature. So there is an end to suffering. So, if you become a spiritual person in order to be something, you're still clinging to ego and you'll actually never attain enlightenment by awakening to the primordial wisdom nature. And the Buddha teaches us that that can be done through the systematic pacification of hatred, greed and ignorance, the pacification of desire, through meditation, prayer, contemplation, study, through the pursuance of enlightened activity. Now let us take a look at compassion again. The Buddha teaches us that in cyclic existence suffering is all-pervasive and that there is one thing we have in common: we all equally wish to be happy. We are all working so hard to be happy. The Buddha teaches us as well, that in our nature we are the same. Every sentient being that you see has within them the Buddha seed or the potential to be Buddha. Many have attained Buddhahood. And when you consider that each one of us has that same innate potential, you must follow logically and understand that, at some point, each one of us will be a Buddha. And at that point, who is to say who or what is better than any other? How interesting! According to the Buddha, we all weigh the same in terms of importance, significance and value. That means men and women are the same, blacks and whites are the same, rich and poor are the same, people of different nationalities, different religions are the same, caterpillars and humans are the same. Yes! They all have the same nature. That's a prejudice you don't want to give up, isn't it? But, according to the Buddha, all sentient beings are equal, and we are especially equal in that all wish to attain happiness. Now, imagine what it would accomplish to think only of our own happiness. Not only are we the same, but we are, in our nature, indistinguishable from one another. If we were to look at each other from the enlightened perspective, we could not determine where it is that you end and I begin. These lines are drawn up by ignorant minds. In truth, Buddha nature is all-pervasive. So it doesn't pay to think of my benefit and not yours. What would I accomplish? Only the reinforcement of my ego. I would tell myself that I am somebody important and separate. It would not accomplish enlightenment. Logically, the Buddha tells us we should work endlessly for the benefit of all sentient beings until they are free of suffering. Logic tells me that there are many more of you than there are of me, that collectively you weigh more than I do. Therefore, I should dedicate my life to your well-being, not to my own. That's logic. That's the only thing that makes sense. Kindness is not such that we're doing anybody a favor by practicing it. Do you realize that? People will say, "You know, I understand this idea of practicing compassion, but I don't feel particularly kind. I just don't have it in me. I'm selfish a lot." My answer is always the same: "Welcome to the world. Do you think you're different from anyone else?" We're all like that. It is this habitual tendency. Where you begin to change this habitual tendency is the intellectual examination of this information and the creation of a new activity pattern based upon it When you come to the realization that kindness isn't a favor you're doing anyone, or something you do when you want to be a good person, you will understand that kindness is the only thing that males sense. At his point your habits will begin to change, and little by little you will begin to act in a compassionate manner. You'll know you have it when you don't remember whether you've been compassionate or not, when someone says to you, "That was so nice of you, you were so kind" and you can only think, "What else would I have done? That was the only thing to do." The Buddha teaches us that everything a sentient being does has a little hook on the end of it. And the hook is: I...me...always about me. So you have to watch when you're being kind that you're not being kind just to be a certain way. What you really want to do is to alleviate the suffering of sentient beings. It's about them, not about you. Get the big picture. All sentient beings are suffering. Get that they, like you, don't wish to suffer. You can help others understand the value of kindness. You can demonstrate it. You can begin to show people the value of being of benefit to others. You can help people to understand in some simple way that there is something better than the superficiality that they are revolving in. You can pray for their enlightenment. Make prayers for the end of hunger, prayers for the end of war, prayers for the end of suffering in all its forms. You can do that, and in doing that, you have actually entered onto the Path. It's just a baby step, but a good one. It is one thing that you can do quietly in your heart. No one ever sees it. You can do it without expecting anyone to pay you back. The upshot of all of this then is to consider compassion in a new way, in a sense to consider it in an ordinary way, in that you can truly practice it within the context of your life. But more than that, know yourself! See what your motivation is. On this path your motivation is everything. Examine the faults of cyclic existence so that when you accept the hard work of this path, even if it's just simply acting in a compassionate way, accomplish it for the right reasons. Take into yourself the fundamental truth that cyclic existence is faulted, but that the Buddha said there is an end to suffering, and it is attainable to you if you open your eyes and act appropriately. Don't waste your time gathering unto yourself things that you cannot take with you. Don't waste your time. Practice the Path. Teaching and guiding people not poses! I am often asked how I see and understand bodies and how to work with each persons unique needs in a classroom setting. And my approach has been and is just as unique as the individuals themselves. First and foremost as a student in an open classroom, we as guides can only see whats in front of us. All to often what I see is students falling into old patterns of movement, shaping their bodies in ways that are not naturally supportive to their own structure, and falling into the easy spaces where little effort or awareness is being felt. And this is where I can begin, with observation of how you are currently inhabiting your being from both a structural and emotional basis. It's all quite visible when you are truly stepping back to observe. Often times the person I'm observing has completely detached from their own experience. Perhaps for good reason or perhaps just unaware that they have left the building! My approach is to bring students to the here and now so they can become aware of their own body and how they are currently seated within. We check in on all levels, physical, emotional, and mind states as to what is needed in that moment. From here, enters breath awareness. The breath is oh so telling! And the way we breathe can take us from 0 to 60, 60 to 0 or somewhere in between depending on the desired effect. And once breath has been established we can begin shape shifting. As we begin what is perceived as the physical portion, we must first understand that it is not that simple. We are not all these different pieces and layers but each part directly affects another part of our being, and therefore it is really the whole being we are working with. However in relation to the movement of the physical body, my approach is to use a general sense of alignment or feeling sense as a way to guide students into being present in their bodies. What do you feel and where do you feel it? What that means is that we are not just talking abut how to cue and position the posture, but how to receive the cues from your experience so you can understand how to accommodate your own unique structure and needs. And this is what makes the practice super deep allowing an integrated approach for all the bodies within the body. Many of us have experienced whats known as the domino effect in our bodies. Life's little reminders of our experiences signal us as aches and pains, Most of us ignore the little cranky remarks our bodies bring to us daily. And this can have a long slow drain of unaddressed compensatory patterns on the body. The best way to avoid this is to keep our body moving, our fascia juicy and hydrated, and maintain deep awareness of how we inhabit our being every day. The more we care for our being and keep our tissues hydrated, the more we will fine tune our living experience in all its glory. Its nice to know where your body is in space, but also feel and sense a graceful full body orchestration of movement. This is a process and a practice we must attend to daily! So get on your mat and check in, let me know how it goes and if I can help! Another sweet offering to the Bindu gods and goddesses from our resident mandala artist! The Importance of Connection, Community, and Giving Back! We are so plugged into technology and social media yet we are so unplugged from our community and our person to person interactions. So how do we reconnect and find our way back to each other and our community. How do we expand our understanding of each other that is in service to ourselves and how can we be of service to others in order to understand how alike we all are and how we all have the same basic needs and desires in life! There is something so incredibly powerful about choosing to give your time and services. You’ll be left with an immense energy that is indescribable when you volunteer, especially somewhere where you can really make an impact. You also see that no matter what you do in an effort to help better any situation, people are grateful for your presence and appreciate your efforts. “But more so than solving problems, volunteering does something more, It creates connections across geographic, cultural and racial borders that helps us see beauty in more places. 1. First take some time to reflect on what your passionate about, where you would like to give back or offer your services. 2. Research or google programs that are looking for volunteers in your area of interest and your geographic location. 3. Volunteer your time to the cause and get involved first hand to make a difference. 4. Unable to volunteer time, then donate what you can. Money, food to the food bank, blankets and clothing to the shelters, or anything that can be of use to the cause. Tapping into your natural resources for sustainable happiness and balance in life! We are all to often caught up in a fast moving lifestyle, that requires us to use other tools to switch off, fire up all cylinders, numb out, cope, survive. More often than not these tools we use are propelling us into an unhealthy and often unhappy groove that we get stuck in “the rat race. We are bombarded by consumerism and told we need more “stuff” to make our lives better, we need pharmaceuticals to overcome ailments caused by the lifestyle we are living, clothing to make us feel better about how we look, a bigger fancier car, etc. However beyond all of that, sustainable happiness is achievable, it could be available to everyone, and it doesn’t have to cost you anything. Research shows that sustainable happiness comes from other sources. Some of the most simple resources I use for myself and for my clients to help them see whats already available and are simply waiting for us to acknowledge and play upon. These are some alternative forms of tapping into the magic and medicine that is within each one of us. We always have natural and free ways to create balance and happiness that are actually in service to our own wellbeing, and can begin to heal old patterns at the same time. This is my own list that I use to keep me on track and to remind me of the gifts already available and present in life. Please feel free to make your own list that serves you and your highest well being! opportunities that lie before us! word that meets you where your at and has a positive up lifting vibe. have a big impact on your relationships with others and yourself. generates more peace of mind. In my experience its best not to rely on friends and family for this resource. We often place to many expectations on what we think they can or should be doing for us. freeing up some stagnant energy. whenever you can. Its free! down while you eat to appreciate the gifts on your plate! help release all kinds of feel good happy hormones in the body. painting. Whatever it is that makes your heart sing! Watch full segment on CBS12 HERE! Sitting at a desk for hours on end, staring into your computer screen, and scrunching your shoulders as you type can create a stiff neck, tense shoulders, tight back and hips. Fortunately, yoga can offer great relief from many of the stresses associated with working in an office or at your desk for extended periods of time. Certain yoga movements can even be accomplished in just a few minutes, right at your desk. Yoga stretches and deep breathing helps to oxygenate the blood, improve blood flow to the muscles and relieve tension from the body while clearing the mind. Take a break and do these four stretches at your desk to offer some stress relief. Performing some basic yoga shoulder stretches may help loosen your shoulders and increase circulation, possibly helping to alleviate pain and feelings of tightness. To perform, slide your chair further back from your desk while keeping your hands on the desk. Place palms flat while bending forward until your chest begins to lower level to your arms, stretching the entire spine, shoulders, and chest. Forehead may rest on desk or release the head to hang lower to go a little deeper. Remain for 5 deep mindful breaths while the body releases. While seated in our chair extend both arms out in front of you, then cross your left arm over top of your right. Bend your elbows and bring your forearms toward one another, bringing as much of the palms of your hands to touch as possible. Raise your elbows toward the ceiling until you feel a beneficial stretch along your upper back and shoulder blades. Hold this pose for a few breaths, then release. Feel free to play around with where you move the arms to find the stretch that suite you. When we sit at our desk all day long we get really tense in there. This can effect pain in your lower back. This posture stretches hip rotators, outer thighs, and relieves tension in the lower back. Sit in your chair and cross your right ankle over your left thigh, flexing the right foot. Keep the bottom foot on the floor and lean forward you can even put your hands on the desk in front of you. When you lean forward you get the stretch in your outer hip. If available you might even fold over the top thigh, draping your torso and head towards the floor. Be sure to do both sides. Twists help bring circulation to your lower back and help flush out tension, an area that can become tight and stiff from too much sitting at your desk. Twists are useful for increasing feelings of energy and vitality and can help release tension from your spine. To perform a simple seated twist, sit toward the front of your chair with your right leg crossed over left thigh leg and left foot flat on the floor. Inhale and extend your spine. Exhale and twist to the right, bringing your right arm to the back of your chair. Look over your right shoulder. Hold this pose for several breaths, then return to center and repeat on your left side. Essential oils come from the life-blood of plants. When plants are harvested, they are distilled or cold-pressed to extract the essential oil. This leaves the dry herb, which only has 3% of the "nutrition" left in it. Most of the "power" of the plant stays in the oil, which we can use to support our bodies. They are highly concentrated aromatic essences and come exclusively from specific parts of plants like the leaves, flower, fruit peel, tree resin. Watch the full segment on CBS channel 12 HERE! How do we stop and reset when feeling like your losing control and frazzled at work. WEST PALM BEACH, Fl. (CBS12) — We all have those moments where you feel like you are completely losing control and are just frazzled at work. But how do we stop this feeling? Yoga-guru Angel Lucia stopped by for #MindfulMonday with tips of how to press your internal reset button. Check how you are holding yourself. Get the alignment of your body just right so you are not closed in or becoming tense. Sit up straight, pull your shoulders back and open up your chest. Always remove yourself from the situation. It's easy! Simply step away for a moment, and center your thoughts. Become clear and still. Take some slow deep breaths into the belly and allow the exhale to release very slowly through your mouth. You may choose to sigh which helps release tension as well. Pay attention to your actual now experience and invite yourself to gently, consciously and lovingly relax tension and ride the ripple of your breathing. You will feel calm, expansive and connected. So when it's time for you to return to the situation at hand, you'll have a new and clear perspective on how to handle things in peaceful manner. Mindful Monday: Books to inspire you! "There are many books I recommend for deepening your truth and understanding of this life, our bodies and our relationships with all beings," says Angel. Among the list are Meditations for the Mat and Journey to the Heart. If you are a busy person with little time, these two books may be for you. They are filled with short, but powerful daily meditations for you to read. Angel recommends reading these types of stories right when you wake up in the morning. In the mood for something to really dive into? Check out The Untethered Soul. "I just love the journey it takes you through," says Angel. This book will ask for your full attention by offering moments of self-reflection. Browse our book selection HERE! Relaxation is beneficial for everyone, but especially for those struggling with sleep. As a nation that is terribly sleep deprived and driven to work non stop. Sleep can often be elusive to many. Our minds are going at a rapid rate so it can be quite challenging to slow everything down and allow ourselves time to rest. Practicing some simple relaxation techniques before bed is a great way to wind down, calm the mind, and prepare for sleep. Dim the lights in the hours leading up to bed. This means turning computers off, phones, or any lit screens that affect our natural cycles of sleep and wake. Take a warm bath with essential oils that have a sedative effect. Oils like Lavender, sweet marjoram, vetiver, amongst many others all are known to be stress relieving, tension reducing, and can help relieve insomnia. Progressive muscle relaxation. Starting with your toes, tense all the muscles as tightly as you can, then completely relax. Work your way up from your feet to the top of your head. Place your legs up the wall while in bed. This soothing, restorative posture calms the nervous system, eases muscle fatigue, soothes the mind, and helps restore healthy, restful breathing. With slow, rhythmic breathing, you will be tapping into your “rest and digest” nervous response. Be prepared to melt deeply into your sleepy time. Deep breathing. Close your eyes, and try taking deep, slow breaths, making each breath even deeper than the last. Work towards extending the exhale longer than the inhale, and linger as long as you comfortably can at the bottom of the out breath. Easy wake up routine to welcome a new day! Studies show that when we have a healthy routine to waking up we can create feelings of peace, gratitude and strength that resonate through out the day. Moving from our morning practice on to the rest of our day, we are more calm and aware, and are easily able to see the good that happens all the time. A practice that includes yoga, meditation and intention can create the space to keep us lighter and carry us through an otherwise stressful day. 1. from the moment we are semi conscious of waking our brains are already busy planning or rehearsing the day before the eyes even open. As soon as you become aware you are waking and caught in excessive planning, take a deep breath in and let it go with a big sigh to relax and ease into the now experience. 2. Begin slow simple stretches before sitting up. Knees to chest, easy double knee twist to begin flushing the back and kidneys out from being still all night, And some reclined side bends always feel good. Each night as you sleep the bodies tissue retracts. It like cold play dough that needs to be rolled out and warmed to make it longer and more workable. Applying these gentle movements when we awaken lengthens and stretches our tight bodies preparing us for all movement throughout the day. 3. Sit up and spend 5 minutes watching and lengthening your breath. Learning to listen to all that going on inside without engaging with whatever arises. Try to rest in the spaces of no thought or between breaths. Hang back and observe, breathe and be with yourself…its only 5 minutes of quiet you time. Take it, you wont regret it! 4. Before you leave your bed, set an intention for the day, choose a positive word or uplifting statement that can meet you where your at right in that moment! 5. Hot water with lemon! Yes we’ve all heard about the benefits of starting the day with warm water and lemon…well its for real! Start your morning this way to help aid the digestive system and make the process of eliminating the waste products from the body easier. ****if one doesn't have fresh lemons in the house, add food grade lemon essential oil to the water. Once you try lemon essential oil in your water you may never need to buy real lemons again. I carry it everywhere with me to add to water throughout the day! Then with a sweet gentle smile on your face you can carry on with your day spreading kindness and peace to all you meet! How to meditate....a very simple and accessible recap on finding your meditative groove from our Mindful Monday's segment on @wpeccbs12 this past Monday! There are so many techniques and styles of meditation that it can be confusing at times where to begin. These simple steps will give you access to a profoundly life changing practice that will not only be incredibly good for you but also for all whom you interact with on a daily basis. Think of the ripple effect, if your met with kindness and ease it will ripple out to the next person and so on. Meditation should feel like the most natural thing in the world, and if doesn't then it's time to change your technique! Start in the simplest manner and make it easy to do. Make yourself comfortable. Sit, lie, stand, sway, dance. Whatever it is make your body comfortable so your not to busy being distracted by the discomfort. Discomfort creates a lot of noise in the body and when we have a lot of internal noise it becomes to difficult to focus on anything else. Get comfy! Breathe….your breath is a gift! Begin paying attention to the breath flowing in and the breath flowing out. Notice all the subtle nuances of how you breathe, where it goes in the body, how it feels, the temperature of the breath, and the sound. Aim to practice around the same time everyday. Make it a ritual for yourself, sacred you time! Start with a very small time frame of 3-5 minutes to help you ease into the practice. Over time you will find that you crave more time and may bump it to 10 minutes in the morning and 10 minutes in the evening. Make it accessible and successful so you want to return again and again! Any questions??? Alright then go practice some you time, simmer in a few moments of spaciousness, listen to your breath and let it soothe you! Watch full segment here or go to "FOR YOU" tab above for free recordings of guided meditations! Calming 30 minute Yin sequence! To come into the pose position yourself in a sitting position with optional support under your bottom. Once situated, bring the soles of your feet together and move them away from the body allowing the knees to fall open. Begin to fold forward noticing the reaction of your muscles. Once the back is rounded, adjust the placement of your feet until you achieve the muscular reaction you are looking for (look for your whole body to be in agreement with the shape, a clear yes); the further the feet are away from the body, the less you’ll feel it in your groin. Be sure that the feet are not so close that your groin or hamstrings could prevent you from reaching a fully rounded spine. Our goal is to eventually find stillness so that the emphasis can be taken off of the groin and instead be on the rounding of the spine and the stress on the hip joints. Once you have found your edge, the place in a pose where there is some discomfort and intensity but never pain, remain in the pose for three to five minutes. Allow the neck to hang (unless there has been recent trauma or whiplash, in which case it should be supported) and the hands to rest comfortably on the feet, the floor or in this case on my lower back. Keep your focus on your breath, and if the mind wanders simply bring it back to the rhythm of your breath or follow the sensations in the body. When ready to release, press your hands into the floor and slowly begin to ease back into an upright position. Spend a few moments taking notice of any new sensations in the body and allow the body to give you feedback on how its responding. You may also opt to use your hands to assist the knees back up and then give them a little sway side to side to help release and move the energy. To come into the pose begin from a sitting position, spread your legs apart until you begin to feel a slight tug through the inner legs and groin. Sitting on a cushion will help tilt your hips. Slowly begin to fold forward, resting your weight into your hands with your arms, or rest your elbows onto a block or bolster. Find a place where you can settle into the sensations and become still. Always allowing ones bones to become heavy and the pull of gravity to deepen your experience. After 3-5 minutes place hands in a position of support, press down through the palms and slowly roll yourself back upright. Remember to move SLOWLY! Spend a few moments lingering in the sensations as they change while gathering input from your body. Then just as slowly as before use your hands to scoop up under the knees to assist them into a bent position. Optional to take a little swish of the legs back and forth to release or counter. Bolster the hips up higher on a pillow or folded blanket (especially if there is a history of sciatica). Small pillows or rolled blanket under knees. If head is too heavy for the neck, support the head in hands or if close enough to floor place a block under forehead. Begin by lying on your belly. With arms out in front of you bend the arms to grab the opposite elbow. Begin moving the elbows underneath your shoulders, and then prop yourself up so that you are supported by your forearms with hands out in front of you and palms flat on the floor. This is sphinx. You should feel mild to moderate compression in your lower spine. There should (as always) be no shooting pain, numbness, tingling, burning or pain outside of discomfort. We tend to carry a lot of stress in our shoulders so be conscious of that while in this pose as well as being sure to keep your glutes relaxed. If you feel that your body is ready for it, move into seal turning the hands outward and then straighten the arms. Adjust the distance of the arms according to sensation. Remember to refer back to the three pillars of yin, time (patience), edge (strong sensation), and stillness. Once you are in seal or if you have remained in sphinx be sure to give your body enough time to access the connective tissues, find your body’s edge to get the greatest benefits from the pose, and try to be as still as possible in order to keep the connective tissues engaged. Listen to your body. If seal is getting too intense, slowly but deliberately move back down into sphinx and find stillness. Remain in this pose for three to five minutes and come out of it by simply lowering your chest to the floor and turning your head to one side. You may find that child’s pose is a nice follow up as is lying flat. Be sure to pay attention to any sensations the pose may have created such as lightness in the back or a surge of energy that was once blocked. Enjoy! To come into the pose, start by simply sitting back on your heels with feet flat on floor. Take a moment to notice of how this feels. For some this may be plenty already particularly if you have tight ankles. If your ready to go further place your hands behind you on the floor while leaning back and begin to feel the arch in your lower back. Stay here for a moment noticing a possible pulling sensation in the quadriceps. Breathe into it! If this feels okay, begin to lean back onto your elbows. The arch in your back should be fairly dramatic here but not painful. Be sure to remember that discomfort and pain are two different things. If you are ready to take the full expression of the pose, come into a position where you are comfortable enough to slide your feet apart so the hips are on the floor between the feet. Begin to lower your shoulders towards the floor, stopping to lay on a bolster if the sensation is too intense. If you have made it onto the floor or a bolster allow your mind and body to settle, breathe, relax, and find stillness. Ideally this pose is held for three to five minutes, but if any kind of painful sensation arises while in the pose back out and take Sphinx/Seal. When you are ready to come out of the pose, do so very very slowly. If you start to come up too quickly, your body will send you a strong signal. Come up just the way you came down; onto the elbows first, then the hands, and finally to rest on your heels. From here, either slide forward onto belly or very very slowly release into Downward Dog. Stay here for a few breaths. Then come into Childs pose allowing everything to recover and neutralize. A bolster to support the back while maintaining a significant arch. A rolled blanket to relieve pressure from the ankles. Alternatives: Half Saddle with one knee bent or leg extended. If to intense for the knees, ankles or causes any pain in SI (sacro-iliac joint) simply return to sphinx. Come into the pose by lying on your back with your knees bent. Place your arms by your sides with your palms facing down for support. Lift your hips and torso off the floor and place a block under your sacrum to rest on. Start with the block at the lowest height, adjusting it to a higher position if your low back is free from compression. If your getting a clear signal from your body that this feels good, begin to extend one leg pausing to see how this affects the lower back. If the signal is still clear, extend the other leg. Block may need to move a little lower (towards the lower buttock crease) to accommodate the low back. The relationship with the low back and hips changes once legs are extended. Please listen to the body and adjust accordingly or rebound the knees. From here the final and full expression is to extend the arms overhead allowing the backs of hands to rest on the floor. The elbows may bend to find a comfortable resting place for the shoulders. When you are ready to come out of the pose, do so very very slowly. If you start to release to quickly, your body will send you a strong signal. Come out the same way you came into the shape. Bend knees, lower arms, then lift hips so very slowly (just high enough to remove block) once block is removed, slowly lower the hips to floor. Stay here with knees bent for a few breaths, and soak in the sensations flowing through. Then bring the knees into the chest allowing everything to recover and neutralize. From a seated position with your legs out in front of you simply begin to drape your torso forward over the legs by walking the hands out along side the legs. After adjusting and modifying with props as needed, settle into the pose for 3-5 minutes. If you begin to feel discomfort (not pain) simply breathe into all places you feel the sensation. After the 3-5 minutes, place hands on floor beside legs for support and very slowly begin to roll your upper body up one vertebra at a time. Once you have returned to a seated position, let the legs stay out in front of you and allow time for the body to give a response. Then bend the knees and move your legs from side to side (like a windshield wiper) to release them from the hips. A nice way to counteract and neutralize this pose is to simply lie flat on your stomach for a minute or two. Pay close attention to any kind of shift in energy; a feeling of lightness or decompression or even a pulsing sensation. If you have sciatica, sit on the edge of a cushion or on a rolled blanket. If you are in the midst of a flare or have severe sciatica, this may be a pose you choose to avoid. If you have any sort of lower back disorder that does not allow flexion of the spine, keep the spine very straight (not rounded) or avoid the pose altogether. If the neck begins to feel strained, support the head in the hands by resting the elbows on a bolster placed in your lap or place a block between the legs for the elbows or head to rest on. If you have a lot of flexibility in the hamstrings, you may not feel the spinal release until you separate the legs a little to allow for a deeper release. A bolster, blanket or block to rest your head, especially if you have any neck tension. Once you you've released from the last pose allow yourself to lie down and let your body rest in savanna for 7-10 minutes or whatever time you have available. Your body will reset and you'll return rested. Slowly ease back into your day or evening. Allow the shapes to become your friend. Create a healthy relationship with the sensations and emotions that arise and know that it will continually change over the course of time. Breathe, soften, and allow yourself to be fully present to all that is. Open to the new friendship your creating with your joints and tissues. Ahhhh, mmmmm, ommmm or anything that rolls around off your tongue can be used as internal mantra to help anchor the mind. Enjoy the journey! Yin yoga has been a great blessing in my life. When I first began practicing yin I wasn't at all prepared for the quiet, stillness, and drama that ensued inside my head. I was coming from a very active Ashtanga Vinyasa practice and had been in a place of push thru it, keep going until you get that arm balance, more hang time in handstand, just one more chataranga. All that intensity and pushing began to break my body down, as well as my spirit. Yoga had become to competitive, no longer about the practice simply being a practice or your practice. Of course this was partly my fault as I had forgotten the true essence of my practice and what my first teacher Kali Ray had imparted upon me. I also got caught in the competitive motion of things. The teachings and practices became all about how many chatarangas can be turned out in 90 minutes, who has the most amazing arm balances, handstands, and who is who in the fancy yoga pose world. We all know yoga is not a competition, but that was exactly what it had become at this time. The emerging of the rock star yogi 's had hit the scene. Things became flashy, showy, with way to much fan fare around what the teacher was wearing and what fancy pose they were going to do. With all this my body began to breakdown, a feeling of being contracted, less flexible, and always very sore. My practice no longer nurtured me, softened me, allowed me to let down my protective armor that I was trying desperately to let go of. However I didnt see it until I began to practice yin. My first exposure to yin was back in 2006 when I happened upon a class while practicing in LA. I found myself in a random class having no idea what was about to happen and honestly not knowing anything about yin. Well, it blew my lid off! I was more challenged than ever before, more challenged than any active practice had offered me. That first experience shook the very core of my being. The teacher spoke just a little bit about the shapes, offering some variety within the same primary shape according to your body and then set a timer and left us in silence for majority of the time. He would interject with little cues and suggestions while holding. And once the bell would go off we would slowly find our way out of the shape and into another. Sometimes with a little movement in between and other times we would move right on to the next shape. All the while my body sinking deeper and deeper into places I had never felt before. My mind on the other hand was freaking out from the stillness, and the time seemed to go on forever. I remember wondering if the timer was broken and wanting so badly to get out of the shape. I was resisting, restless, impatient, moving between tension and release. As soon as I felt some release I had fear flood my body and mind and would pull back again, resisting the sweetness that the earth was right there to catch me. Over time I slowly learned the art of surrender in both my body and mind. I released my strong hold on life and allowed myself to sink deeper than ever before. My mind melted into spaciousness wandering from breath to sensations to soft sounds floating around. I became present to just being, my body let go of long held tensions, and I felt more space in all areas of body, mind, and heart. I truly allowed gravity to move thru my being, pulling me closer to the earth so I could be held in the loving arms of our greatest mother. I melted, I cried, I surrended myself! The practice of yin is both challenging and liberating. It takes us out of our hectic lives and gives us time to slow down, release, to pause rather than push. A beautiful practice that reminds you to come home to yourself...your inner self! Today my practice is very different. I no longer push myself beyond what my breath body is allowing in Vinyasa. I play my edges safely and let my breath body tell me where we are going. I am no longer interested in what fancy shapes I can make with my body. If I naturally find my way into them through the progression of my practice then I play, if I feel heavy or resistent I pause and find my way into a long hold to investigate the resistence. Is it my body, mind, or breath resisting? And what am I resisting? I have been fortunate to have studied with many great teachers Paulie Zink. Paul Grilley, Denise Kaufman, Sara Powers, and many more that have gifted me with guidance and support through my yin process. I highly recommend giving Yin a try. If you are looking to study yin, seek out the greats, the original yinsters I mentioned above. Paul Grilley and Denise Kaufman are my two faves as they both offer the space and quiet to truly unfold. Here are 2 great articles on Yin! Now go give your body and mind the gift of a quiet yin practice...love yourself, release yourself, and just be! Mediation - It's already happening so dive in! What do you love so much in this life that you want to meditate on it, the things that tickle your soul. To meditate, we sit and pay loving attention to the rhythm and pulsation of life renewing itself. How does life renew itself? Life is always in motion, rhythmically pulsating as it heals and evolves itself. The breath, for example. Breath is one rhythm we can pay attention to. Just for a few seconds, notice the way the breath is flowing into and out of your body. There are many little things to love about the way breath feels, and if you start paying attention in a loving way, you will settle into meditation. There are innumerable other rhythms, such as the heartbeat, or the rhythm of thoughts and silence. Meditation allows us to access a naturally occurring rest state; it is resting in yourself while remaining awake and alert. It is different from sleep, in that the rest is much deeper and happens quickly, and you become more aware than usual. Meditation happens spontaneously for a few seconds or minutes when we gaze at the horizon, a sunset, a river, the ocean, or lie on our backs and gaze upward at the night sky. We can cultivate meditation intentionally, we can set aside a time each day to meditate, and this has great benefits. Even a few minutes of meditation here and there can help your day to be more full of grace and good humor. There are at least three ways that meditation helps with healing on a physical and emotional level. – Meditation lets the body rest more deeply than sleep, even though you are sitting up and are awake. – During meditation your body-mind system lets go of the past, and of the hurts of the past. As if a lot of time has passed. – After meditation, you are less likely to get stressed over little things, so you will tend to have less stress-related illness. Rest is one of the most profound human needs. We all need to sleep and dream. We all know how rejuvenating sleep is. Meditation gives us access to that kind of renewal, only on a deeper level. Life organizes itself in a rhythm of action and rest, action and rest. And if we do not get rejuvenating rest, our performance degrades. Meditation gives the body a chance to reset its clocks and enter action and sleep in a more harmonious manner. When we rest, the body (including the nervous system and brain) tunes itself up, repairs damage, gathers energy, and gets ready to go. Think of the deepest rest you have ever had in your life. You woke up and you could hardly move. That correlates to about an 8 percent reduction in oxygen consumption. Oxygen consumption is an indicator of how much work the body is doing. During sleep, oxygen consumption gradually declines over a period of four or five hours, to eventually reach this 8 percent reduction. During meditation, oxygen consumption decreases by 10 to 17 percent within the first 3 to 5 minutes. This is a spontaneous side effect of paying attention in a meditative way, and is felt as a powerful sense of physical relaxation and ease. In other words, the body spontaneously goes into this state when you practice a meditation technique that suits you. Meditation is innate, and your body already knows how to do it. The human body has an instinctive ability to shift into profound rest states in order to heal, energize, integrate, tune itself up and assimilate learning. It is almost a sure bet that you have already experienced this many times in your life. Meditation can happen spontaneously, as when you are sitting on a hill looking at a sunrise or sunset, or when listening to music. Most people I work with remember meditating many times in the past - only they did not call it meditation. It was just a personal time, a special time they had with themselves or with nature. Meditation is paradoxical in that you are resting more deeply than sleep, yet you are wide awake inside. It is similar in some ways to taking a nap but you don’t fall asleep, you fall awake. You can induce it by attentively doing anything simple and repetitive. We breathe all the time, and breathing is rhythmic, so you could pay attention to your breathing. There are so many ways in. Meditation promotes a heightened awareness of the details of everyday life. Even a few minutes of meditation will help you move through the world with more relaxation and alertness. Meditation is giving attention a chance to explore its full range, both inward and outward. It is a conversation between your inner and your outer life. This sounds simple, and it is. But there is no end to the delights of attention; there is always more to learn, more to explore, more to awaken to. "He trains himself to breathe in sensitive to rapture, and to breathe out sensitive to rapture. He trains himself to breathe in sensitive to pleasure, and to breathe out sensitive to pleasure. He trains himself to breathe in sensitive to mental processes, and to breathe out sensitive to mental processes." Here the tone of attention is nutritious, nurturing. These teachings direct attention to be sensitive to rapture and pleasure. You are taking delight in simply existing. Your body, nervous system, and your senses can set their own parameters. Meditation is selecting some aspect of life’s rhythms of self-renewal, and then riding that inward to touch your essence, rest in essence. Life renews itself through rhythm: the flowing breath, the pulsing heart, cycles of activity and restfulness, flows of energy and passion in the body, all the subtle nerves (nadis) flowing with prana, the prana humming and singing mantras to itself as it flows through the bodies, rhythms of brightness and darkness, wakefulness and sleep and dreaming. These are just some of the rhythms of life. The rhythm of life renewing itself feels like love. Feels like falling, floating, melting, opening. Love brings up our fears to be healed. The physical body and the prana body love each other and love to play together, coordinate, in the way that your different muscles love to coordinate and synchronize. It’s a deep joy to flow together. Meditation is a way to let body and soul come closer, inter-permeate each other, care for each other. Select aspects of life’s rhythm that appeal to you - use the same hunting instinct you use when finding music you love. a whole meditation practice can be in movement, and at some point when the energy settles you will want to close your eyes and let yourself linger in the shimmer of sensation! Now go meditate, delight in life renewing itself!